Joachim of Fiore, also known as Joachim of Flora (c. 1135 – March 30, 1202), was a Christian visionary and abbot whose teaching of a three-stage providential history kindled tremendous expectations for the reform of the Catholic Church and the coming of a new age of the Holy Spirit. The son of a court official in Calabria, Italy, Joachim followed at first in his father's footsteps and became a notary to the influential archbishop of Palermo in Sicily. After a powerful conversion experience, he became a monk, and then an abbot, and gained a reputation both for his teachings and his piety. He was encouraged by several popes to complete his writings, which detailed his understanding of God's work through three stages of history and his vision of the coming of a new age in which the monastic orders, rather than the institutional church, would become the center of a new world society of spirituality and peace. After his death, Joachim's teachings became the center of controversy between reformers, especially the Spiritual Franciscans, and the more conservative elements in the Roman Catholic Church. His views on the trinity were mildly condemned as early as 1215, but his historical vision continued to provide powerful fuel for those who opposed ecclesiastic wealth and corruption, including the extremist movements of the Fraticelli, Dulcinians, and Brethren of the Free Spirit. His historical teachings were formally declared heretical in 1263, but his ideas continued to be influential up to the Protestant Reformation and beyond. Dante declared him a prophet and placed him in paradise in his Divine Comedy. 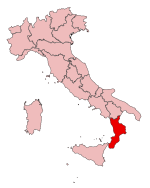 Born in the small village of Celico near Cosenza, Calabria—at the time, part of the Kingdom of Sicily—Joachim was the son of Mauro the notary and his wife Gemma. He was educated at Cosenza, where he became a clerk in the courts and then a notary himself. His father, whose office was an influential one under the Norman kings of Sicily, placed him under the powerful Archbishop Etienne du Perche of Palermo, who also served as regent for the young William II of Sicily. Around 1159, Joachim went on pilgrimage to the Holy Land, where he underwent a spiritual crisis and conversion in Jerusalem that turned him away from the worldly life. When he returned, he lived as a hermit for several years, wandering and preaching before joining the ascetic Cistercian abbey of Sambucina near Luzzi, Calabria as a lay brother, where he devoted his time to preaching without taking holy orders. Under pressure from ecclesiastical authorities, he formally joined the monks of the Abbey of Corazzo and was ordained a priest in 1168 or 69. He then applied himself entirely to biblical study, with a special view to uncovering the arcane meaning concealed in the scriptures, above all the Book of Revelation. To his dismay, he was acclaimed abbot by the monks of Corazzo (c. 1177). He then attempted to unite the monastery to the Cistercian Order, but was refused because of his community's poverty. In the winter of 1178, he appealed in person to William II of Sicily, who granted the monks some lands. 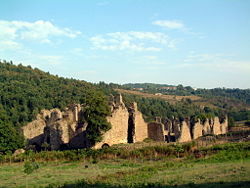 In 1182, finding the duties of his office an intolerable hindrance to what he deemed his higher calling, he appealed to Pope Lucius III, who relieved him of the administrative care of his abbey and warmly approved of his work, bidding him continue it in whatever monastery he thought best. He spent the following year and a half at the Cistercian Abbey of Casamari, engaged in the writing of his three great books. His dictations reportedly kept three scribes busy night and day. The young monk Lucas (later archbishop of Cosenza) acted as his secretary and was amazed to see so famous and eloquent a man wearing such humble clothing, and was deeply impressed by the devotion with which he preached and said Mass. Joachim developed a three-stage, trinitarian understanding of the history of God's providence culminating in the approaching dawn of a new age of universal spirituality. He predicted the coming of an "angelic pope" who would do away with the corruption and luxury of the church and usher in an age of the Holy Spirit in which monastic life would play a key role. His interpretation of verses in the Book of Revelation led him to predict that the hierarchy of the church would become unnecessary and infidels such as Muslims and Jews would soon submit to the Christian faith. In 1184, Joachim was in Rome and was again encouraged by Lucius III. Papal approbation was confirmed by Urban III in 1185, and again, more conditionally, by Clement III in 1187, the latter exhorting him to make no delay in completing his work and submitting it to the judgment of the Holy See. Although his books remained unpublished, his drawings of the Trinity and the broad outlines of his teachings became well known. Some sources hold that Richard the Lionheart wished to meet him to discuss the Book of Revelation before leaving for the Third Crusade. Joachim retired to the hermitage of Pietralata, writing all the while, and then founded the Abbey of Fiore (or Flora) in the mountains of Calabria. Flora became the center of a new and stricter branch of the Cistercian Order, approved by Celestine III in 1198. In 1200, Joachim publicly submitted all his writings to the examination of Pope Innocent III, but died before any judgment was passed. The holiness of his life was widely known, and Dante would later affirm that miracles were said to have been wrought at his tomb. File:BorromeanRings-Trinity.svg Joachim's Novi ac Veteris Testamenti (“Book of Harmony of the New and Old Testaments”), explained his theory of providential history, in which the three ages of God's dispensation are related to the three persons of the Trinity. In Psalterium decem chordarum he describes a vision of a triangular psaltery with 10 strings, which clarified the mystery of the Trinity for him. His Expositio in Apocalypsim (“Exposition of the Apocalypse”) examines the coming of the Antichrist followed by the new age of the spirit. Rather than a cataclysmic end of the world in which the elect alone escape destruction, he envisioned a transformation of the world into a spiritual kingdom centering on the ideal monastic life. The mystical basis of Joachim's teaching is his doctrine of the "Eternal Gospel," founded on an interpretation of the text in Revelation 14:6: "Then I saw another angel flying in midair, and he had the eternal gospel to proclaim to those who live on the earth—to every nation, tribe, language and people." Based on the verses which precede these verses, Joachim held the the new age would be founded on the monastic orders, centering on those who held strictly to their vows of chastity. No one could learn the song except the 144,000 who had been redeemed from the earth. These are those who did not defile themselves with women, for they kept themselves pure. The Age of the Father, corresponding to the Old Testament, characterized by obedience of mankind to the Rules of God. The Age of the Son, between the advent of Christ and 1260, represented by the New Testament, when mankind became the adopted sons of God. The Age of the Holy Spirit, impending, when humankind was to come in direct contact with God, reaching the complete spiritual freedom preached by the Christian message. According to Joachim, the Kingdom of the Holy Spirit, a new dispensation of universal love, would proceed from the Gospel but transcend the letter of it. In this new age the ecclesiastical organization would be replaced and the Order of the Just would rule the Church and transform the world. Only in this third age will it be possible to really understand the words of God in its deepest meaning, and not merely literally. He concluded that this age would begin around 1260 based on the Book of Revelation (verses 11:3 and 12:6, which mention "one thousand two hundred and sixty days"). Instead of the parousia (the literal Second Coming of Christ on the clouds), a new epoch of peace and concord would begin, thus making the hierarchy of the Church unnecessary. After his death Christians acclaimed Joachim as a prophet, a title he himself had refused to acknowledge. Joachim's teachings became highly controversial and had a major impact on the millenialist movements of the thirteenth century and beyond. The Fourth Council of the Lateran in 1215 condemned some of his ideas about the nature of the Trinity, but did not declare him a heretic. Although Joachim was not specific about the identity of the "Order of the Just," it was later identified with the new Franciscan Order by the Franciscan Gerardo of Borgo San Donnino. Gerardo held that, about the year 1200, the spirit of life had gone out of the two Testaments and that Joachim's three books themselves constituted the new "Eternal Gospel." The Catholic priesthood and the whole teaching of the New Testament was to be rendered void in a few years. The head of the Franciscans, John of Parma was pressured to resign his post because of his "Joachist" views. 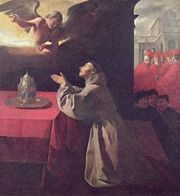 His successor, Saint Bonaventure, repressed the more extreme interpretations of Joachim's teachings. However, echoes of Joachim's ideas can be seen in Bonaventure's writings as well. Among the more zealous of the Spiritual Franciscans, an overtly "Joachist" group now arose, many of whom saw the Antichrist already in the world in the person of Frederick II, Holy Roman Emperor. Meanwhile, the failure of the ecclesiastic reform movements led to passionate calls for a return to apostolic poverty among the entire clergy. 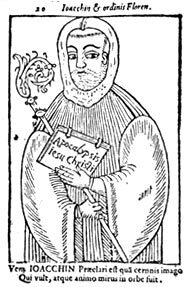 As the appointed year of 1260 approached, spurious works began to circulate under Joachim's name: De Oneribus Prophetarum, an Expositio Sybillae et Merlini ("Exposition of the Sibyl and Merlin") and commentaries on the prophecies of Jeremiah and Isaiah. Inspired by Jochimist apocalyptic visions, the Dulcinians and Brethren of the Free Spirit went so far as to engage in major violence against church property and wealthy bishops. The town of San Giovanni in Fiore, where Joachim founded a Cistercian abbey late in his life. Finally, Pope Alexander IV formally condemned Joachim's writings and those of Gerardo of Borgo San Donnino, setting up a commission that in 1263 the Synod of Arles eventually declared his theories outright heresy. Thomas Aquinas further criticized his theories in his Summa Theologica. Nevertheless, Jochim's ideas continued to find fertile soil in the minds of many medieval Christians who hoped for reform in the Church and the coming of a new age. A later leader of the Spiritual Franciscans, Pier Giovanni Olivi (d. 1297), revived Joachim's teachings, as did Ubertino da Casale, who left the order in 1317. The latter plays a role in the popular Umberto Ecco novel and popular motion picture The Name of the Rose, along with two monks whose past association with the Dulcinians results in their trial and execution for heresy. In The Divine Comedy, Dante Alighieri placed Joachim in paradise. Traces of his thought have been traced to several movements leading up to the Protestant Reformation and to later writings such as those of Schelling, George Sand, W.B. Yeats, and D. H. Lawrence. A three-stage theory of history, though perhaps not directly connected to Joachimism, can also be seen in Marxism (primitive communism, private ownership, and industrialized communism) and the Divine Principle of the Unfication Church (Old Testament Age, New Testament Age, and Completed Testament Age). ↑ Liber Concordie novi ac veteris Testamenti. Figurito, Joseph. Gioacchino Da Fiore and Dante Alighieri on Moral Renewal. Chestnut Hill, MA: John J. Burns Library, Boston College, 2003. ISBN 9780962593451. Gould, Warwick, and Marjorie Reeves. Joachim of Fiore and the Myth of the Eternal Evangel in the Nineteenth and Twentieth Centuries. Oxford: Clarendon Press, 2001. ISBN 9780199242306. McGinn, Bernard. The Calabrian Abbot: Joachim of Fiore in the History of Western Thought. New York: Macmillan, 1985. ISBN 9780029195505. Reeves, Marjorie. Joachim of Fiore and the Prophetic Future. New York: Harper & Row, 1977. ISBN 9780061319242. Reeves, Marjorie, and Beatrice Hirsch-Reich. The Figurae of Joachim of Fiore. Oxford-Warburg studies. Oxford: Clarendon Press, 1972. ISBN 9780199200382. Tavard, George H. The Contemplative Church: Joachim and His Adversaries. Milwaukee, Wis: Marquette University Press, 2005. ISBN 9781423733621. West, Delno C., and Sandra Zimdars-Swartz. Joachim of Fiore: A Study in Spiritual Perception and History. Bloomington: Indiana University Press, 1983. ISBN 9780253331793. History of "Joachim of Fiore"
This page was last modified on 8 May 2018, at 21:53.